The impasse over the second term bid of Lagos State governor, Mr. Akinwunmi Ambode, is yet to be resolved as his benefactor and National Leader of the All Progressives Congress (APC), Asiwaju Bola Tinubu, remains adamant over his opposition to the governor’s return to power in 2019. Reports had it yesterday that President Muhammadu Buhari, on Wednesday, intervened on the matter, following a meeting with Tinubu in Abuja, but a competent source close to the APC national leader told New Telegraph last night that no such meeting took place. Another source close to Tinubu, told one of our correspondents that nothing has changed on the matter. “I can tell you that nothing has changed. Tinubu is still adamant. He is opposed to the return of Governor Ambode,” a competent source told this newspaper. Ambode’s second term bid is under threat following the decision of the Managing Director of Lagos State Property Development Corporation (LSPDC), Babajide Sanwo- Olu, and a former Commissioner for Works and Infrastructure, Dr. Obafemi Hamzat, to contest the APC governorship primaries. A top member of Tinubu’s camp who told our correspondent that “nothing has changed” on the APC leader’s position, said: “Nothing has changed with the situation of things about Lagos APC governorship candidate. It is still a stalemate over Ambode’s ambition as Tinubu’s is still adamant over the governor’s re-election bid.” Speaking on why Tinubu and other party leaders are annoyed with Ambode, the source said: “People are not happy with the governor because of how he cut off everybody immediately he assumed office.” It was however learnt that Oyo State governor, Abiola Ajimobi, and some South-West APC leaders have waded into the matter, with an appeal to Tinubu to change his position. Others reported to have intervened are Vice President Yemi Osibajo and a former justice of the Supreme Court and Nigerian Ambassador to the United Kingdom, Justice George Oguntade. “There is ongoing move to reconcile Tinubu and Ambode. The move is being spearheaded by President Buhari, who has reached out to Tinubu, asking him to allow Ambode to return for a second term. The President has asked some prominent chieftains of the party to intervene in the matter and I can assure you that the matter would be resolved very soon,” a party source said. The source added that it was the President and other stakeholders’ intervention that forced Sanwoolu to put his public declaration for the governorship race on hold for now. “Sanwoolu planned to do a public declaration in Lagos after submitting his nomination form at the party secretariat, but the idea was cancelled at the last minute because of the ongoing reconciliation efforts by President Buhari and other party leaders,” the source disclosed. But, in a swift reaction, the Babajide Olusola Sanwoolu Campaign Organisation (BOSCO) in a terse message last night, said its principal ambition is on course. “The Sanwoolu Campaign Organisation is on course. His formal declaration will happen shortly followed by his rally. The campaign organisation remains focused on its objectives and will not be distracted by unfounded rumours and insinuations. We thank all APC members in Lagos for your overwhelming support,” the statement read. In a related development, Sanwoolu, also yesterday announced the composition of his campaign team. A former Chief Security Detail to Tinubu, Tayo Ayinde, was named Director General of the of the campaign team, while the Majority Leader of the Lagos State House of Assembly, Hon. SOB Agunbiade was appointed Legal Adviser. A former Deputy Speaker of the Assembly, Hon. Wasiu Eshilokun, was named Head of Research and Intelligence. Sanwoolu also inaugurated three coordinators each for the senatorial districts of the state. According to the list circulated on social media, the senatorial coordinators are Hon. Rasak Ajala (Lagos West), Hon Wahab Alawiye King (Central) and Mayor Dele Oshinowo for Lagos East. The chairman of Agege Local Government Area, Hon. Egunjobi Kola, who was appointed as coordinator of NGO, Civil Society and Students, confirmed that he was aware of the list and that he is a member. Others are Alhaji Abdullah Enilolobo (Mobilisation), Adeniran Onilude (Special Duties), Tobi Lawal (Fund raising ), Sesan Dani (Media and Publicity), Bolaji Ariyo (Security). Also on the list are a House Representatives member, Jimi Benson, who was appointed coordinator of Planning and Strategy; Hon Bolanle Akinyemi-Obe (Women Affairs);Wale Adelana (Ethnic Affairs) and Ayoola Fatai (Welfare). The former chairman of Mosan- Okunola Local Council Development Area, Abiodun Mafe is charged with Party Affairs; Kolade Alabi (Finance); Dr. Sulaimon Aleshinloye (Medical and Safety); Kamal Olohrunoje (Volunteers group); Fuad Atanda-Lawal (Youths); and Rev. Samuel Olufemi Ogedengbe (Religion). Meanwhile, APC chieftains in the state are said to be divided over who to support for the party’s governorship ticket between Ambode and Sanwoolu. 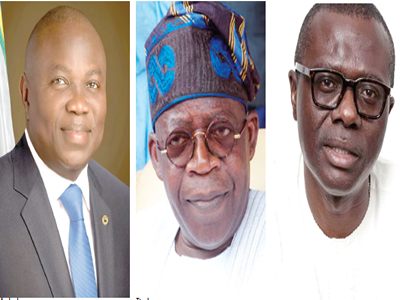 Investigation by New Telegraph revealed that some of the party leaders in the last 48 hours have been holding meetings in different locations in Lagos to strategise for the party’s primaries as well as the general elections. Our correspondent gathered during a visit to one of the meeting points of the party leaders in Ikeja yesterday that some members of the party were locked up in a meeting that lasted several hours. Among those who attended the meeting were members of the Governor’s Advisory Council (GAC), the highest decision body in Lagos APC. But as the crisis festers, traditional rulers in the state, yesterday, paid a solidarity visit to Governor Ambode at State House, Alausa, Ikeja. The monarchs, however, left after about 10 minutes, when they couldn’t see the governor. New Telegraph learnt that the monarchs, who had come to attend their weekly meeting at T-Block located within the Lagos State Secretariat, drove to the governor’s office in a convoy to pay him courtesy call. They were allowed to drive through the gate by security personnel and protocol officers, but they were told that they could not see the governor. Sources at the State House told New Telegraph that the governor was not available to attend to the traditional rulers. An aide to one of the monarchs told our correspondent that the visit was not unconnected with reports that Tinubu is out to truncate Ambode’s second term ambition with his endorsement of Sanwoolu. The source said that the monarchs had attempted to see the governor in order to seek how they can intervene in the crisis. “The traditional rulers, over 20 of them, came to the State House today to see the governor. One of the monarchs I could recognize during the visit was Ranodu of Imota in Ikorodu Local Government Area, Oba Ajibade Agoro. Though I don’t know the reason for their visit, it could be on the issues that have surrounded his second term ambition. But less than 10 minutes after their arrival, they left the premises,” the source said. Another source hinted that the governor, who arrived yesterday from Epe, his home town, didn’t attend to the monarchs because he was busy addressing some issues of governance. According to him, it was his aides that attended to the monarchs on their arrival. Meanwhile, the Lagos State PDP, yesterday said it would be glad to receive Ambode into its fold if he decides to leave APC for whatever reason. The party through its Publicity Secretary, Mr. Taofeek Gani, said: “Any forward-looking party will not reject its main opponent joining it, especially a big personality like Ambode. We are ready to welcome him to our party if he decides to join for any reason. We are very ready to accept him, if he decides to join us. “We cannot turn down our opponents, especially a big personality like Ambode. Therefore, he is welcome. His joining us will definitely add value and boost our chances to win the state.” He added that PDP will accord Ambode all the rights and privileges enjoyed by members for him to realise his political ambition.